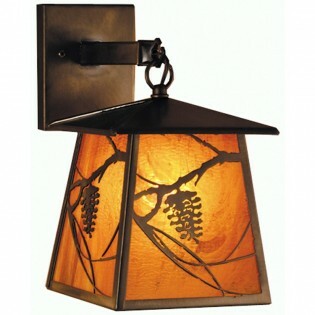 This handsome one light Lantern Pine Cone Sconce reflects the modestly adorned Bungalow style with Pine Cone accented lantern shade of Honey art glass which is suspended from linear Antique Copper hardware. Made in the USA. This handsome one light Lantern Pine Cone Sconce reflects the modestly adorned Bungalow style with Pine Cone accented lantern shade of Honey art glass which is suspended from linear Antique Copper hardware.